1977 was a very active year for Saab. Much was happening, even if it didn't seem that way outside the factory walls - or in production and sales figures. 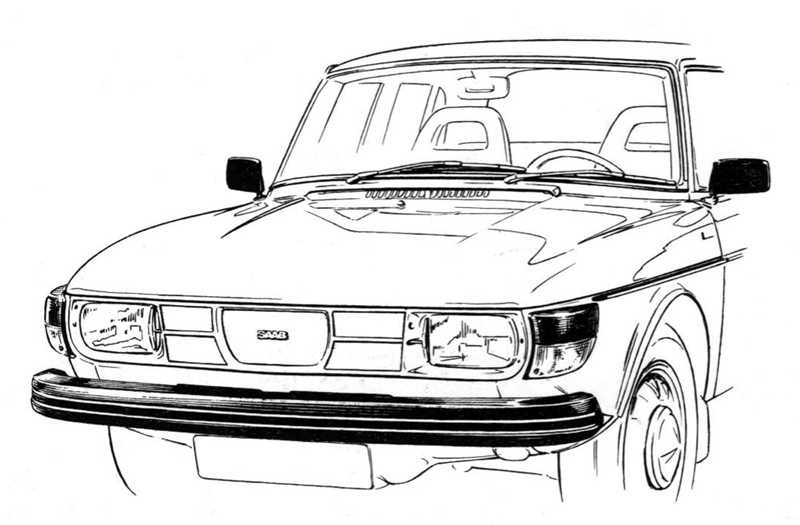 What made Saab much wider known practically all over the automotive world was the sensational Saab Turbo. It actually wasn't available for sale until the end of the year, and then as a '78 model, but car people in both Europe and America could test the car through the large series of pre-production cars that were built during the spring. Most of the press reports were so laudatory that Saab people were afraid of repeating them for fear of being accused of excessive bragging. The 1977 model year offered the same line-up as the later part of the '76 year, although with the slight difference that the 99 delivery van had been moved up to the GL range, and was called "99 van". Most models also offered a number of changes, such as: 99 seats in the 96; new corner lights in front and new rear lights on 99s; new side moldings on GLE; new emblems on some models; larger rear-view mirrors on all 99s and bumpers with new decor strips on all except GLE. Five new colors had also been introduced. Remaining from before were Coral White, Solar Red and Opal Green, as well as the slightly altered Silver metallic (now also optional on the 96). Topaz Yellow, Sienna Brown, Carolina Blue and Sepia metallic had been replaced with Antelope Brown, Dorado (dark brown), Astral Blue and Anthracite Grey and Cardinal Red metallic. Black was also in the line-up, mainly on the Turbo. 95 and 96: with the assist of a two-step carburetor the output of the V4 engine had again been increased, now at 68 hp. On the competition scene Stig Blomqvist again brought Saab the overall victory in Swedish Rally, in a 16-valve EMS. 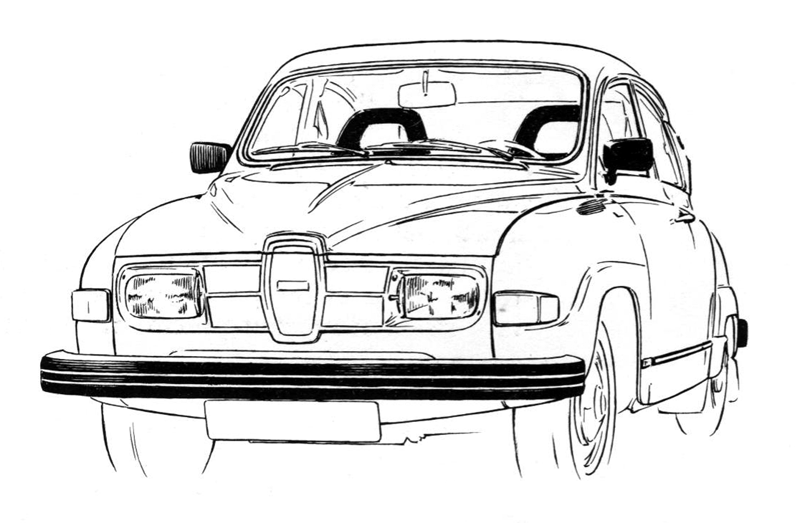 With total production of 95,927 units Saab set an all-time production record in 1976. 99 models accounted for 72,819 of the total, while the remaining 23,108 were 95 and 96, by now only sold in a few countries. The 1977 figures did not reach that high, mainly because of market conditions both in Sweden and abroad. Total production 1977 was 76,498. Uusikaupunki produced 22,835 cars; Mechelen 4,253; Arlov 9,948 (both 95 and 96); and Trollhattan 39,462. Just over 60,000 of the total were 99s including 1,066 Turbos. 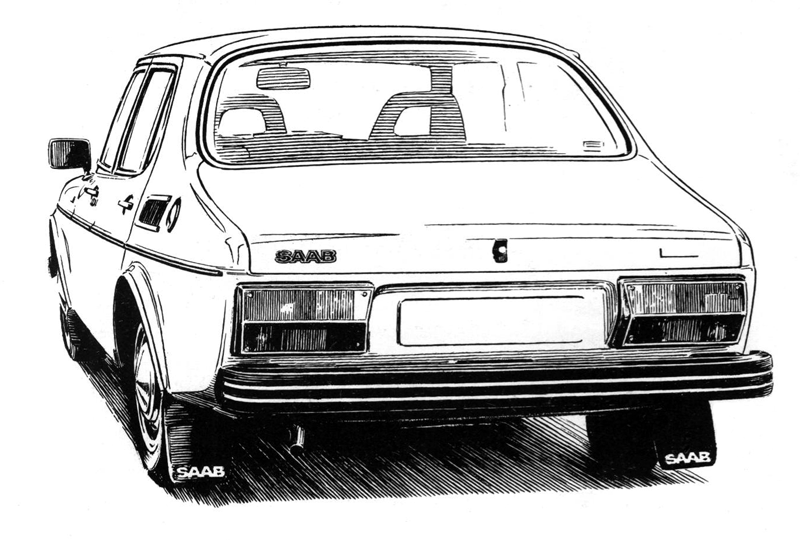 In spring 1977 100 units of the Saab Turbo were built. Most of them looked like this. Marked in black are the visible innovations on the 1977 95/96 models. What cannot be seen is the fact that engine output was increased 6 horsepower, without any increase in fuel consumption; that 95 now had 4.5; inch rims and electrically heated rear window; or that both models had thicker carpets, improved seat belts and 55 amp alternator. All eight 99 models got larger and more functional front corner lights for 1977. Where the law allowed it certain models had them also functioning as cornering and side backup lights; on US models they also contained reflectors. All 99s also had bumper decoration strips like the previous GLE; larger outside rear-view mirrors in black housings; revised windshield wiper mechanism, as well as a new steering wheel. The 99 sedan models (2-door L, 2-and 4-door GL, and EMS and GLE) received new rear-end light treatment for 1977 with large multi-function light clusters. The trunk latch was also redesigned, while the GLE now had bright side moldings with black edges.